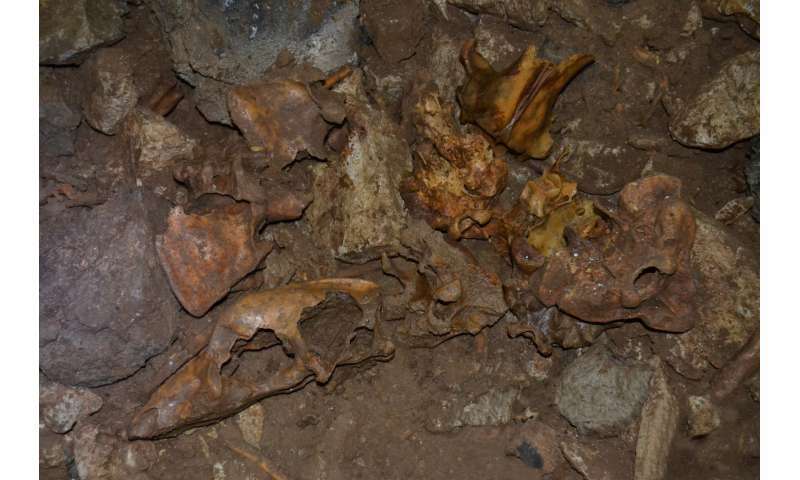 An international team of researchers has found evidence of extinct cave bear DNA in modern bears. In their paper published in the journal Nature Ecology & Evolution, the group describes their genetic analysis of modern brown and polar bears and how they compared with extinct cave bears. Cave bears were a type of bear that lived in Asia and Europe. They were slightly larger than today's brown bears, but fed on vegetation instead of meat. They went extinct approximately 24,000 years ago (during the Last Glacial Maximum) for unknown reasons. In this new effort, the research team was focused on learning why the bears went extinct. To that end, they conducted a DNA analysis on samples taken from four bear's remains from approximately 35,000 years ago. 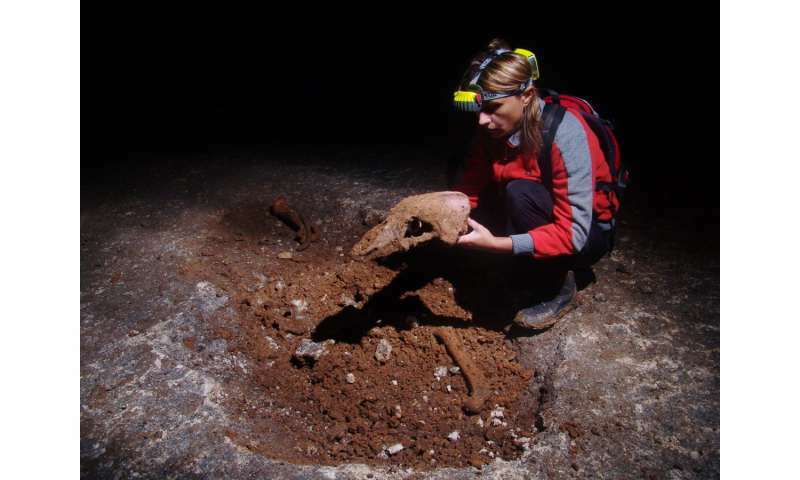 Their goal was to study how the population of cave bears changed in size over long time periods. As an aside, they decided to compare the DNA from the extinct cave bears with modern bears. The researchers report that their comparison revealed that modern brown and polar bears both have cave bear DNA—on average 0.9 to 2.4 percent of their genome is cave bear DNA. They noted that the two types of modern bears are more genetically alike than they are to the cave bears. But they found that either was capable of mating with a cave bear, and that their offspring could breed with any of the three types, as well. They point out that their results are not surprising—the similarities between the bears, the overlapping time period in which they lived, and their habitat proximity made interbreeding a near-certainty. 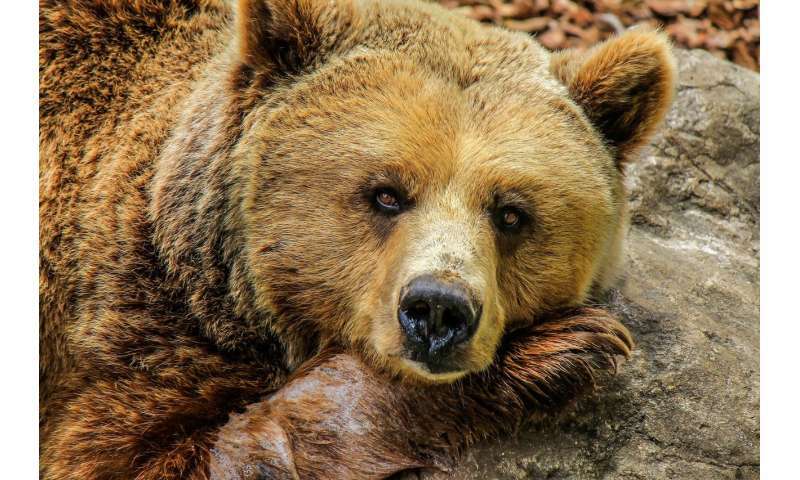 The finding of extinct cave bear DNA in modern bears is the first example of DNA from an ancient extinct species found in a modern species other than humans—we have remnants of Neanderthal DNA in our genomes. The researchers suggest that future research could explore what it means for a species to go extinct—if their DNA lives on in other species, are they really, truly gone? They note that their study reaffirms the fact that animal species interbreed, some regularly. That might have been the case with modern bears and cave bears—the ancient cave bears also had modern bear DNA in their gene pools. Neanderthal genome is 99.84% similar to us. Remnants? More like 99 % I think, outside of Africa most people have 1-5 % Neanderthal alleles. Those differing alleles are the remnants, alleles they evolved after we split and before we interbred. The latest estimates is that these remnants can be pieced together to make 50 % of a Neanderthal (i.e. their differing alleles).